Navigate to your project page in DeployHQ and select 'Services' > 'Notifications'. Click on 'Add New Notification' and choose 'Flowdock' as the notification type. Select a flow below and copy the flow API token to the API token field on the setup page. In the 'External user name' field, define the name of the user from which the notifications will be sent. This can be anything (e.g. 'DeployBot'). 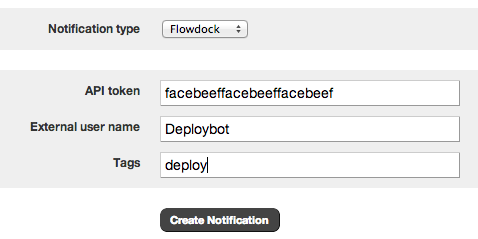 If you want to tag the notifications in CA Flowdock, define the (comma-separated) tags in the 'Tags' field. Finally, click the create notification button. You will now receive deploy notifications from DeployHQ.